A Telugu film on the life of Shirdi Saibaba is on the anvil. 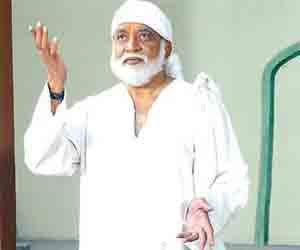 Titled `Jagadguru Sri Shirdi Saibaba’ the film has been launched at a function in the city on Thursday. Director and producer BV Reddy not only dons the title role but also is producing the film under SRR Creations banner. Mohan Babu sounded the clapboard for the film. Home Minister K Jana Reddy who graced the occasion as a chief guest switched on the camera. The film will have Nagababu, Suman, Siva Parvathi and Siva Krishna in other important roles. G Ramakrishna is directing the devotional flick. The film is currently being shot at five different sets of a Shirdi village erected on Road No 25 in Jubilee Hills. Set to be completed in three schedules, the film has music scored by Lalit Suresh. Director B Gopal was also present on the occasion. Shooting of Jagadguru Sri Shirdi Saibaba directed by G Ramakrishna and produced by BV Reddy under the banner of SRR Creations with the producer himself playing the title role was launched in Hyderabad on February 12. Dr Mohanbabu gave the clap, while home minister K Janareddy switched on the camera for the muhurat shot picturised under the honorary direction of B Gopal. According to the music director there are seven songs in the film. Nagababu, Suman, Sivakrishna, Brahmaji, Narayana Rao, Raghunatha Reddy, Ramireddy, Kota Sankara Rao, Satya Reddy, Srinivasa Reddy, Gundu Hanumanta Rao, Hemasundar, Chittibabu, Sarika Ramachandra Rao, Siva Satyanarayana Sivaparvathi, Ramaprabha, Indrani, Divya Reddy and others are in the cast. Dialogues are by Kommanapalli Ganapati Rao, lyrics are by Ashokteja, Gurucharan and Parimi Ramanarasimham, music is by Lalith Suresh, camera is by Srinivasa Reddy, editing is by Menaga Sreenu, while story, screenplay and direction are by G Ramakrishna.